This entry was posted in Citations, Middle East and tagged crazed critics on January 1, 1982 by Matthew. In 1982, Sheila helped to organize the National Emergency Committee on Lebanon in response to the Israeli invasion. The Emergency Committee had an office in midtown and three staff people: Sheila, Nubar Hovsepian (then the Political Affairs Officer for the UN Conference on the Question of Palestine) and Stuart Schaar (a history professor at Brooklyn College). The Emergency Committee was a broad coalition established on June 24 in opposition to the Israeli invasion, whose first action was organizing a demonstration against the invasion in New York on July 10. A rabbi and two Christian clergymen from the New York area yesterday jointly denounced Israel’s invasion of Lebanon and called for the immediate and unconditional withdrawal of Israeli military forces. … The forum was a news conference held by the newly formed National Emergency Committee on Lebanon. The conference was held at the United Nations Church Center at 777 First Avenue. — From “Rabbi and 2 Christian Clerics Denounce Invasion“, by William G. Blair, New York Times, July 1, 1982. The National Emergency Committee on Lebanon, formed in June 1982 to call for withdrawal of Israeli troops from Lebanon, no American arms to Israel and no US troops in the Mideast, also called for US talks with the PLO, the sole legitimate representative of the Palestinian people and American pressure on Israel to end its occupation of Palestinian land. The executive committee included Larry Ekin of the United Methodist Church office at the UN, Sara Flounders of the People’s Anti-War Mobilization, Jawad George of the Palestine Congress of North America, Sandy Pollack of the USPC, Gail Pressberg of AFSC, Stuart Schaar of Jews Against the Israeli Massacre, Mountir Zahr, a supporter of the Lebanese Movement, and Jacki Gelb of MFS. — From Far Left of Center: The American Radical Left Today, by Harvey Klehr, Transaction Publishers, 1988, pp. 155-156. It also assembled background information, like “Lebanon, the Palestinians and the PLO: a profile”, by National Emergency Committee on Lebanon, Race and Class, Vol. 24 No. 4, (1983 April) pp 327-334. It published a booklet “The Human Tragedy in Lebanon”, based on an address delivered at the Riverside Church by Christopher Giannou on August 11, 1982. THE CONTINUING CRISIS IN LEBANON. TEACH-IN, SUNDAY, NOVEMBER 21, noon-9. Hunter College Theater, 69th & Park. SPEAKERS INCLUDE EQBAL AHMAD, ALEXANDER COCKBURN, DR. CHRIS GIANNOU, YAACOV PIPMAN, EDWARD SAID, ELLEN SIEGEL, ZVI ZORES. For more info, contact National Emergency Committee on Lebanon. Phone: 382-1597. — Advertised in the Columbia Spectator, November 19, 1982. Some of these groups were merely new guises for longtime pro-PLO activists. For example, the coordinator of the National Emergency Committee on Lebanon, Sheila Ryan, also heads the Palestine Solidarity Committee, a New York-based group long supportive of the PLO. This was apparently enough for the city of Portland, OR to open a police file on the committee, although nothing substantive ever came of it. This entry was posted in Middle East on June 24, 1982 by Matthew. THURSDAY / 16 … 9:00 THE MIDDLE EAST REPORT. An update of regional events. With Sheila Ryan. — From the “WBAI Folio” for December 1982. Middle East Report / A. Walker | RECORDED: September 15, 1983. – CONTENT: INTERVIEWER: Sheila Ryan| INTERVIEWEE: Israel Shahak, Chairperson of the Israeli League for Civil and Human Rights. Talks about the implications of transition from the governments of Menachem Begin to that of Yitzak Shamir, Foreign Minister and Israel Cabinet. — From a 1/4″ tape reel catalog entry at the Pacifica Radio Archives. TUES 20 … 7:30 PRAXIS. An examination of changing social, political and economic institutions in the Middle East and Asia. Presented by Stuart Schaar and Sheila Ryan. 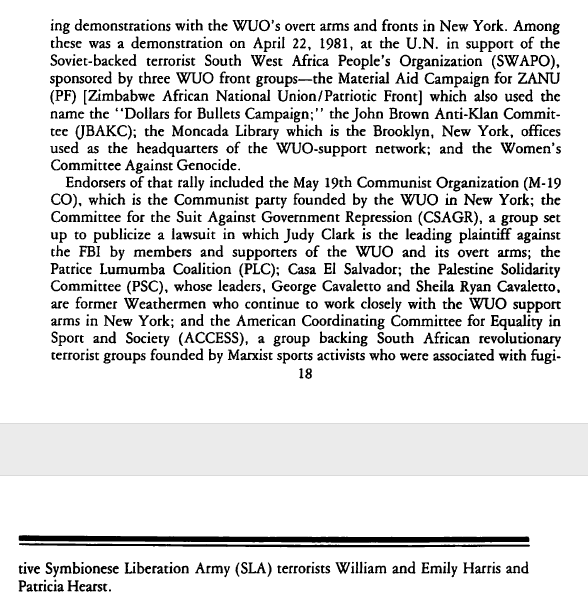 — From the “WBAI Folio” for March 1984. Religious fundamentali.sm — Islamic, Jewish, and Christian — has become a significant taaor in Mideast politics. This program explores what tensions in the various scxieties have given rise to this phenomenon, and what effect fundamentalist movements are having on that volatile region. Produced by Sheila Ryan, Nubar Housepian, and Stuart Scharr. — From the “WBAI Folio” for November 1985. This entry was posted in Middle East, Publications on December 16, 1982 by Matthew.